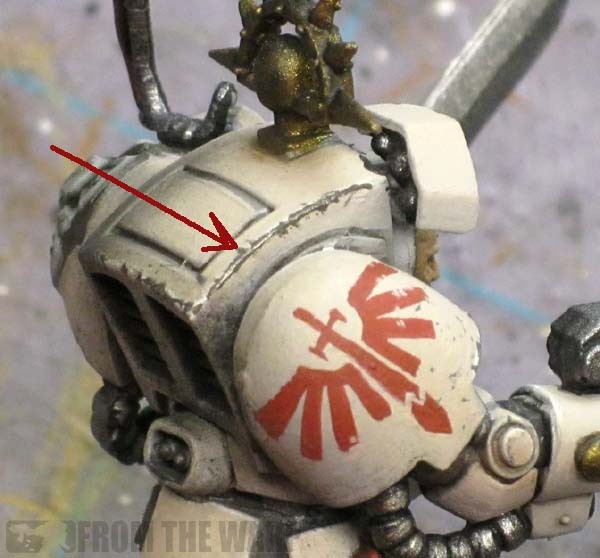 The other day I talked about using metallic weathering powder to achieve worn down and chipped looking armour plates. 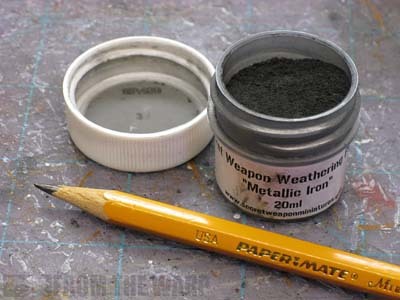 Today's post is a follow up to that one and we're going to look at the metallic powder's close relative, the pencil. simple drybrushing on my new blog. Let me start by saying I'm using nothing more than a regular #2 pencil. All I've done is sharpen the point so I have the most possible control in my application. With the powders, we were taking more of a drybrush approach and covering areas and not so much specific edges or spots on a model. This is where the pencil steps in, if the metallic powder is a blast weapon, the pencil is our sniper rifle. Coming off my previous experiments with powder, I did keep one thing in mind. The difference between working over dark colored armour and light colored armour. Again, like the powder, the pencil can be applied directly onto your model without having to worry about it not looking "right." Since we have a good amount of control in our application, we can get it along the edge without the extra we had when using powder. We also have the ability to add small scratches and such. This is a small feature we could not do with the powder. Here's what I'm talking about. I took this model and you can see how he looks on the left hand side without any weathering on his forearm and hand armour. On the right side, you can see how I used the pencil to make the armour plate edges look worn down. Using a pencil directly over light colored armour creates a new kind of problem. It not only looks "wrong," it can be lost on the model. The reason it can be lost is because of lighting. Since we are using a material (graphite) that is reflective, the light only "highlights" the portion in front of us as the light hits it. The rest of it looks as though it's just a dark line along the edge. So you may have a whole edge "penciled," but it looks as though only a small portion is because of the lighting you're looking at your model under. This is good and bad. Good because it adds a bit of realism to our highlights and bad because we can no longer apply our pencil directly onto light colored armour since it changes based on the lighting we are viewing it under. You can see how the reflective quality becomes important in making a convincing illusion. 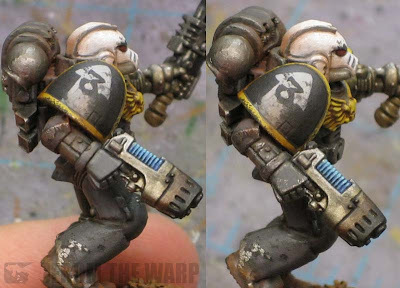 Using silver paint avoids this problem since it is always reflective regardless of where it may be located on the model under any kind of lighting. But we're not using paint at this point, we are looking to expand what we do in terms of weathering. How do we get around this issue then? Easy enough. all we need to do is add in the effect of the light colored armour being chipped away and revealing the primer paint coat underneath. Then we add the bare metal spots after that. I do this by taking the GW Foundation color Charadon Granite and painting it on my model where I want the damage to be. 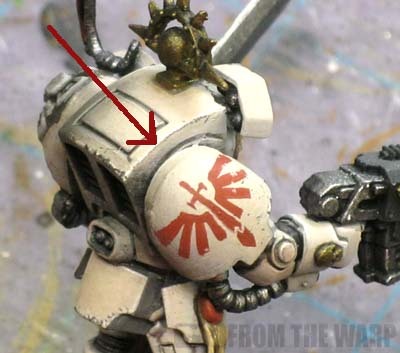 I thin it slightly and apply it to the edges of the armour I want to have "worn down." Then I take my pencil and go in to those areas and add a few spots where it's been worn down to the bare metal. Here's the Charadon Granite applied to the edge of the Terminator torso. Using my paintbrush, I applied a very thin line of it along the whole edge. I used the tip of my brush to expand the damage in a few spots. The trick when putting the base down for your weathering (in preparation for your pencil work later on) is to make sure you get a thin line. Since you are painting a dark color over a light one, it's going to stand out. I hold my brush at an angle like this so I catch just the edge of the armour plate I want to weather. 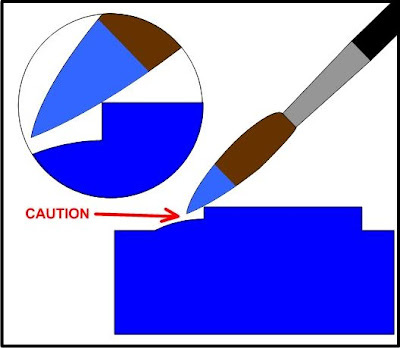 AND... you hold your pencil in the same fashion as you did your paintbrush. 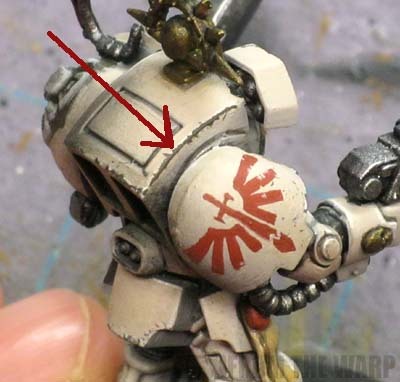 By holding it and using the side, you can focus your metal areas and keep them inside the darker area that was just painted on. Here's what it looks like with the Charadon Granite base and the pencil applied to few spots along the base color. I have not mentioned varnishing models once you apply your pencil or powders for that matter. I suspect nothing will change with the pencil application, but there is always the chance that the effect may become a bit muted as can be the case with some weathering powders. Of course you'll have to do a little experimenting to see what works best for you. I've been using Army Painter Matt varnish on my Imperial Guard tanks (with weathering) and whilst it gives a great matt finish it also seems to let the metallic sheen from metallic paints come through! Its really quite odd like that but perfect for this sort of thing! Highly recommended (by me). The pencil technique is also highlgihted in the Imperial Armour Masterclass book, which is a real hotpot of cool techniques for realistic effects. Also recommended! And using different softness or hardness of pencil lead also allows you to achieve a more or less controlled area of application - the softer B grades being the less accurate, harder H grades being great for armour joints. @Ron: get yourself a high quality graphite pencil -- you'll get MUCH better results for the same method. You can find them in any art store or Michael's. Isiah has it right on the different grades as well. @lycanthropica: skip the crushing or sanding and buy pigments or use pencils -- but always avoid pastels for weathering. Ron has a good article on his attempt to make his own pigments using pastels. S'no good! You want a pure art or cosmetic grade pigment. lycanthropica: I'm glad it helped. I'll be honest though, I'm still learning how to use all these new fancy techniques. oink: If you post a link, it will make it easier for us to see your stuff. If it's relevant to the discussion here, I don't have any problems with it. Isiah: I haven't gotten that far yet. I'm still getting it onto the model. misterjustin: I suspect this may turn out like the whole paintbrush thing did. For now though, the regular pencil works. Once i get that sorted out, I'll upgrade as it were. The tracks are mostly muted due to the weathering done on them, but you can see the shine on the barrels of the guns. You can look at the finished images of my Devildog or Hades Drill too - though the techniques I've used have developed since then. Nice post! I'm going to give this a try on my Deathwing terminators... And you've even given a pic as an example! Nice! Thanks for the link oink! junglesoflustria: That's what I wanted to see... what the effect was like over "bone." Hephesto: Thanks. I'm more experimenting with it now. I like the looks I can get, but by no means am I an expert in the matter. The best thing to do sometimes is try new things on spare bits. Great post here. This (as everything that you do in general) is very helpful. Glad it helped Feldmarshal Goehring! I linked up this article in a thread of mine over at the Dakkadakka.com forum. I hope you don't mind. If you do, I will remove it. Feldmarshal Goehring: Not at all, link away. I try and share some of my stuff over there when I think it's appropriate and might help folks. Thanks! Ron, I linked this article and another of yours up on my blog. I applied your methods to painting battle damage on my Predators with very pleasing results. I wanted to give you the credit for educating me and helping me improve my painting. Thanks for sharing and helping to improve the hobby for the rest of us. Feldmarshal Goehring: Excellent, thanks! I'm glad the post helped out as much as it did. Email me the link to your post, I'd love to see the results.